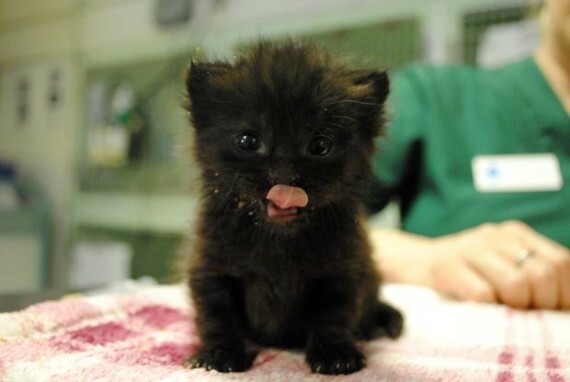 This 4 week old abandoned kitten was found during Monday evening rush hour riding in a Tube train on the Victoria line having been left alone. She was covered in gunk and cowering in a cardboard box. At such a tender age the Blue Cross, who rescued her, say she needs round the clock care before being homed in a month or so. The staff at the Blue Cross have named her ‘Victoria’ after the Tube line on which she was found. For the full story see the Londonist article here. Wilma – You’ll need to find the Blue Cross in Oxford. why cant people who dont want their animals anymore just go to the animal centres and hand them in? at least that way they get constant care. People who do this are heartless & uncaring (If I lived in London and observed this act, he or she would be worse off than that baby). My love to the Queen, Kate,William and the new baby when she delivers,Diana would be so proud!! plenty rescues to leave them into or safely out side to be found …..
And some poor child is crying over it being gone. Either way, big thanks to Blue Cross. It is possible that this kitten was lost!